The post was updated in June 2018. I feel like most people want the magic formula that will skyrocket their traffic, but I can tell you that there isn’t one. The fact is, there are many tactics you can use, but only one strategy. What does that mean? Tactics are things like how many times you should pin per day, deleting pins, following/unfollowing, live pinning vs. scheduled pins, etc. These tactics don’t create content or move your business forward. They simply execute the strategy that you’ve set up. It’s the long-term plan for growth in your business through your content. Let me give you an example- my post on how to clean up Pinterest boards has long been my most popular post. Knowing that my strategy should be to create more content; content that either expands on that post or that offers value equal to that post. Think about it, every time a reader clicks on the opt-in within that post, they are telling me loud and clear that they love this content and they want more of it. As a result of this post being so popular, I created a whole series of “how to” posts. When I did that, it grew my email list even more, which also increased my income. My strategy was taking my original content and expanding on it to initiate growth for the long term. No matter how much passion for your topic you start out with, every blogger can tell you that the time will come when you have to dig deep in order to keep going. Burnout is all too real and can appear out of nowhere if you aren’t careful. I see others in my niche with much bigger numbers than I have. It is easy to compare my numbers with theirs and to let that rob my joy. Keeping my focus on who it is I am trying to help with my blog and why allows me to remain joyful and to avoid burnout. 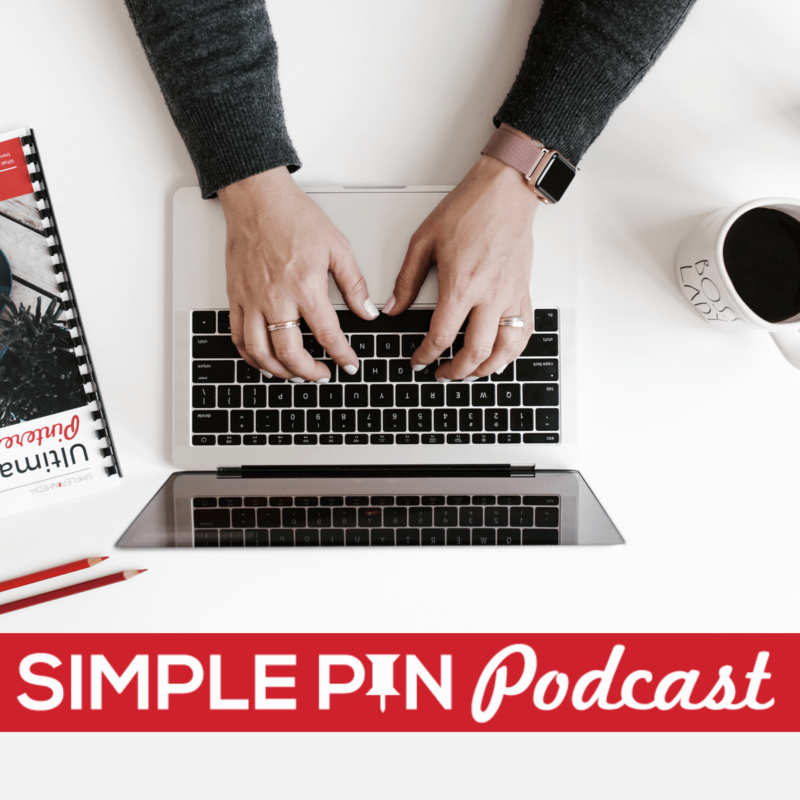 With all that being said, in this episode, I am talking about tactics — what to do when you publish a post and how to get it out there on Pinterest. The first set of tactics I share came straight from the members of my Facebook group when I asked them this same question. Pin to my main board. This is the board where you pin all of your blog content, so it should be named whatever your blog is named. Avoid using the words, “Best of…”. Just use the name of your blog. Pin to two boards related content. Begin interval pinning to other boards the following day. Pin it to my main board. I make sure the description is keyword optimized. Schedule to relevant group boards. This person schedules the pin to go out every 36 hours. Some people use 12-hour intervals, some use 24-, and others pin every 36 hours. There is no magic number, so do what works for you. UPDATE June 2018: Pinterest has recently recommended starting with pinning your new content to the most relevant boards FIRST. Then pin it to your main board. This is the strategy we recommend and encourage our clients to use now instead of pinning to the blog board first. Kristie Hill (who has been on the show discussing Pinterest analytics and Pinterest account growth) is an admin in the Facebook group along with me. She contributed a great tip that was similar to Martha’s tactic. When Kristie inserts the pin URL link in her blog post, she actually tells the reader what to do with the pin. It says something like, “Pin it now”, or “Pin this to your recipe board.” Giving the reader specific actions that you want them to take always increases engagement. Kristie also includes pin links in her email newsletters. Michelle of Making Sense of Cents shared that shey also uses this tactic back when she talked about affiliate marketing here on the Podcast. Go back and listen to that if you missed it and learn how Michelle increases her affiliate income using this method. We pin our clients’ new blog posts to their most relevant boards first and then to their main website board. To keep on top of new content we follow them either through a blog reader or just check their blog daily. When a new post appears on the client’s blog, we grab the link and schedule it to our in-network niche tribes. We then schedule the new pin to their most relevant personal boards, the relevant boards within the Simple Pin boards, and then to their blog board and any relevant group boards that the client belongs to. This enables us to get their content out circulating within Pinterest. Some clients like to do some of their own pinning, so we work with each client to set up their account the way that best suits them. What I hope today’s Podcast has done for you is to give you ideas for tactics to try. You need to choose the ones that best suit your available time, your desired level of involvement, and your level of business. I don’t know everything there is to know about Pinterest. Some of you are well versed in your tactics…you know exactly what works. In the end, remember that it’s all about consistency and adding quality content to your blog that brings value to your readers. Be sure that your tactics leave room for creating great content. Want to join my private Facebook group where we love to chat all about Pinterest. Join here. Thanks so much for this informative article! I hadn’t though of putting Pin It links in email newsletters!! I do have one question, though. After I pin to my blog’s main board with only my pins on it, do I need to wait before repinning that pin to others relevant boards? I am looking forward to learn the tactics you mentioned up here. So that I can create a win win situation over this platform. Thanks for the tips. I do have one question though – I have read loads fo ebooks that say having a Best Of board is best. I notice you say not. What are the arguments against? Not having a go, genuinely interested and willing to switch up my tactics! I don’t like putting Best of vs just the name of your site so when people search they find it easier. My first month of Pinterest I had monthly views of over 200,000, but very few clicked thru to my blog site. Any recommendations? Ooooh, I’m definitely trying that ‘grab the link from your pin and add it to your blog post’ strategy–that’s gold! Let’s see how it works :). Thanks so much for such a great post! Yes! It’s such a great reminder for readers! Just discovered your amazing podcast and blog. I’m still figuring Pinterest out but it has become the #2 driver to my blog behind organic Google search. One question that thus far I haven’t seen addressed is whether it’s better to pin a pin to my primary board and then re-pin from their to other boards and group boards or to pin each one from scratch. It doesn’t matter as much anymore. I tend to just pin via Tailwind which creates a totally new pin anyway. However, sometimes I will pin from what I find in my Google analytics but I haven’t seen it make a huge difference. Glad you found me! I have a question: let’s take your example of the pin being saved in 10 different boards with a space of 2 days. After the 20 days have passed, what do we do with the pin? Saving it again but with bigger day-space? Hi! I am still relatively new to blogging. Until I have my board booster more efficiently set up to pin my own pins, I took the advice to pin my latest pin every other day onto my group boards. But, I am curious what is the best way to go about this? Do I go to my site and pin the image for the blog post and create a new pin for each board or do I go to where I first pinned it and every other day repin that image to different group boards? Thank you! Just discovered this site and in just a few weeks, my traffic has really ramped up! Question about pinning to my main or blog board and then pinning to related topic boards…. Is it best practice to always be pinning directly from my blog or should I be taking the pin from my blog board and repinning/saving it to my other (topic based) boards? Yes to pinning directly from the blog. that’s best! Thanks for the info! If I have a pin that’s doing well on a relevant board, 32K should I pin it back to my main board? It doesn’t show up as one of my pins in Pinterest analytics for some reason. Yes, pin it to every relevant board since it looks like it’s doing well. 1) Tribes. Do you only post your own pins to tribes or is it ok to post other people’s pins too? 2) If I post my own pin to one of my boards, how can other people see it? I’m on tailwind but I just don’t get how it works. I’m pinning people’s pins to my own boards but unless people are following me, they won’t see it right? So isn’t it better to pin it on a board I’m a contributor of? 2. other people will see it in the home feed on Pinterest. Even if they aren’t following you, Pinterest may suggest your pin to them. Great Post! I have a few questions though, I am wondering how frequently I should be posting pins from the same original content. For example, say I write a blog post and make three pins for it, is ok to pin one or two of these every day to my board or group boards so I am continually repinning the same content of mine? or should I just pin my three pins once and then leave them? I am very new to Pinterest as you can tell! Way to go for diving into Pinterest. I would pin them all the first week (all 3) and then wait at least a month before pinning them again. I like to give space between the same pin. If you want to create a new image, you can pin that anytime. The whole goal is to serve pinners with the best experience. When you aim for that you’re golden. No one wants to see the same pins over and over.